It was Monday night. We were recovering from a long Labor Day weekend that involved far too much consumption of free food and a little bit of manual labor. 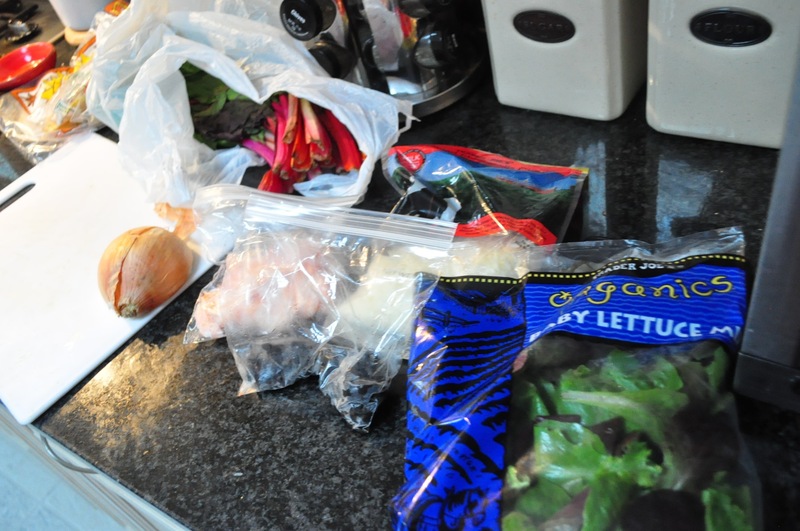 As much as I didn’t feel like cooking, I felt even less like going to the grocery store — again. I had just gone late Saturday night, covered in dirt from our neighbor’s deck-building project, and did NOT want to go again. But, with my stomach directing me through the aisles, I had somehow come home with mostly snacks and few full meals ready to be cooked a couple days later. Whoops! (To my credit, most of my meals hinge on visits to the farmers market, and we missed our Sunday stop last weekend). A portion and a half of shrimp. An onion. A half bag of mixed greens, on the way out. 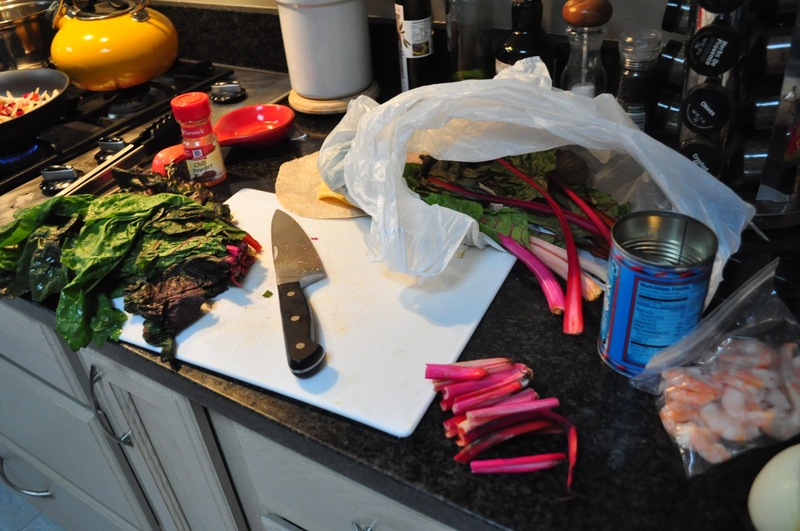 A half bunch of rainbow chard, also on its way out and desperately in need of being used. One flour tortilla, one corn tortilla (seriously?). And a bunch of frozen fish and meat I had planned to thaw… whoops! The poor man has come to realize I LOVE playing Chopped challenge in my kitchen, making something — heck an entire meal — out of the meager offerings of my ill-stocked fridge. It’s economical, for one (You know, the Food Network show Chopped… please tell me you’ve seen it… that it’s your favorite brand of late-night television). Think about how much money you save each day you procrastinate on that grocery trip and, instead, use those ingredients that have been staring you in the face all week. It’s a far better alternative to throwing away food. And it works those creative recesses of the mind that have been, well, out to recess while you’ve regurgitated cookbook recipes each night (not that that isn’t mind-sharpening in its own way). Now I may have set you up with big expectations here, like I’m going to make shrimp-and-rainbow-chard crudités or something. Well, no. I still want to make dinner in 10 minutes flat. Again, have you seen Chopped? Go watch it right now. See what bad shape my chard was in? It needed to be used stat. 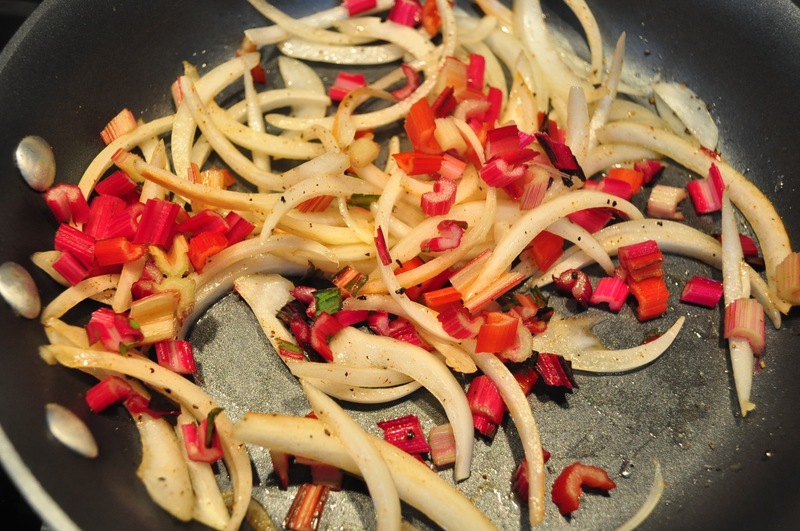 Love to use the colorful stems from the chard for extra crunch and pizzaz. 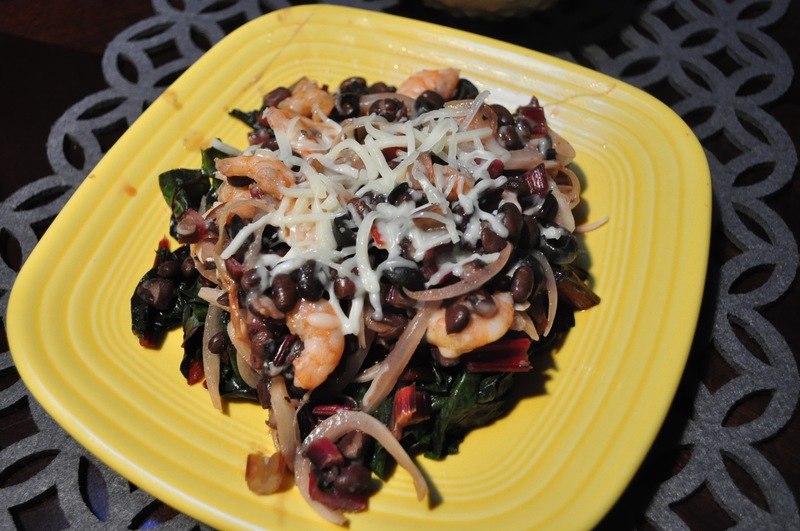 I sauté the onions, wilt the chard in a separate pan (not yet sure what I’m doing with that), add the shrimp and beans and spices and cheese and bam! (I also threw the tortillas in the oven to crisp and make them chip-like… but forgot about them for, oh, a couple hours, at which point they were frisbee-like science experiments in the art of charring). I ask my husband if he’d like his “taco salad” over cold greens or warm. Thankfully, he says the chard looks good — and it found its purpose for the evening. In the end it wasn’t really a taco salad, more of a stuff-on-top-of-cooked chard salad. We added salsa anyway. Taste: pretty good. Presentation: not terrible. Use of ingredients: excellent. Maybe not Chopped challenge material, but these experiments save me time, money and satisfy the ever-hungry husband. So, what are your whatever’s-in-my-fridge cooking stories? Successes? Popcorn, cheese & apples -healthier than you might think!